'Tis the Season for Holiday Flair! 'Tis the season for chesnuts roasting on an open fire and for stockings to be hung on the mantel with care. In this holiday season, warmth, laughter, and gathering with friends and family are the highlights of the season. Here are a few ways to decorate your home with cheer! Accentuate your built-ins with cheerful goodies. From cone like Christmas trees near the TV to stockings hung from a shelf. Make your built-in the focal point of the family room this holiday season! Even staircases can showcase the beauty of the holidays. Garland can make stair rails look elegant while bringing the outdoors...in. Make any mantel look fabulous this Christmas with a more natural look. Neutral tones that are accentuated by deep reds and greens, make this room look peaceful and elegant. Don't forget to make the outside of your home beautiful as well. 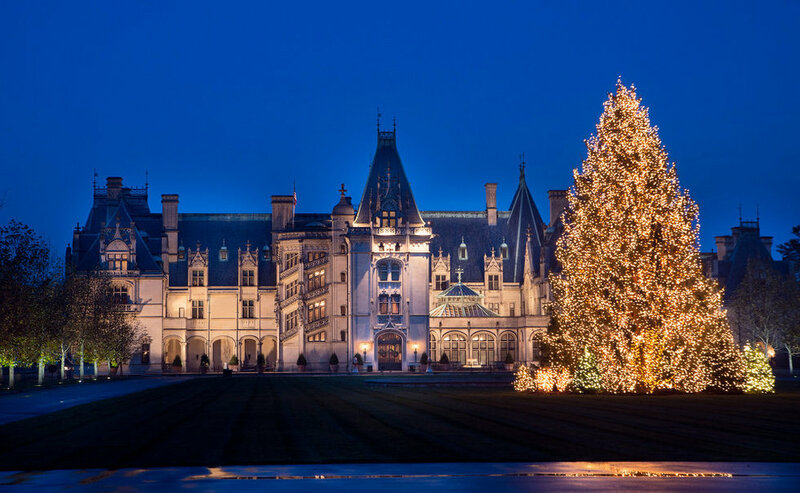 Although decorating the outside of the Biltmore estate (or any home for that matter) may be an undertaking, the outcome is welcoming and beautiful. Overall, make your home joyous by adding your own holiday flair! We hope you have a wonderful holiday season filled with joy and blessings and don't forget to light the fire with care!